I used to watch a YouTuber who said, "H200000, GATARADDEE." I love your profile picture, did you make it? Hello mother how are you doing this grand evening? I just woke up from a nap, so I'm feeling great. How are you doing? Shaquille Oatmeal, Combativeness/xWorpp, WildCam_ and 2 others like this. PapiKirito, Combativeness/xWorpp, Oscaros_ and 1 other person like this. In your banner is that someone drinking Starbucks? Congratulations to Augend, Dva, and TeaSpiller on becoming Forum Ninjas! Joiined, coralines, Combativeness/xWorpp and 1 other person like this. did you know that, Na+Oh- (liquid base) plus H+Cl- (acid) makes H+Oh- (which is H2O) and Na+Cl- (which is salt) which in the end makes salt water? 6 days without power, 7 days without internet, and $5800 in damages to my car from a tree falling on it. Thanks Hurricane Michael. Hope you are good, wish you the best of the luck! Have a nice day everyday! Wow! _H2O Good job on Forum Ninja! But what happened to your recruiter rank? She was recruitment but switched to Forum Ninja therefor she is no longer a Recruiter. But still! FN is pretty cool! 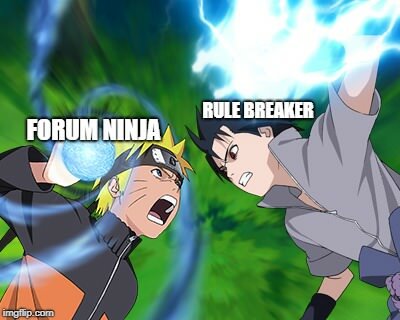 Yep, I made the decision to move from Recruitment to Forum Ninja. I wasn't allowed to be on both since they are two separate Sr. Mod teams. ___TacoCat___ and Enunciated like this. You'll never stop me from applying!